So, what actually is pitch shifting? In the context of guitar pedals, pitch shifting takes the note your guitar is playing and spits out another note at a different pitch. Depending on what pedal you have and the mode in which it's working, the pitch-shifted sound can completely replace your played sound or can exist alongside it as a harmony. Is an octave pedal a pitch shifter? "Notes generally track really well, but the pitch shifted sound can still sound artificial when you're working with larger intervals"
While an octave pedal could be regarded as a pitch shift pedal, in that it supplies a differently pitched note (an octave above and/or below the played note), that's really a distinct genre of pedals in itself. 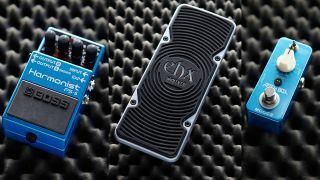 What we are looking at here are pedals that can offer pitched intervals other than just an octave and ones that are polyphonic in that they can shift all the notes in a chord, for example. Aren't some devices a bit glitchy? It was more of an issue in older pedals that didn't have the improved DSP of modern units. These days, notes generally track really well, but the pitch shifted sound can still sound somewhat artificial, particularly so when you're working with larger intervals and upward shifts. Is detuning the same thing as pitch shifting? Detuning, now regarded as an effect in its own right, is a form of pitch shifting where the pitch is not changed by a complete musical interval (a semitone and more). Instead, the pitch change is measured in cents (100 cents equals one semitone). Typically, a detuning effect would add a high and/or a low pitch-shifted note a number of cents away from the main note, resulting in a sound not unlike you'd get with a chorus pedal. Are there different kinds of pitch shifting pedals? You can divide them into three distinct types, although some pedals do more than one thing. There are pedals that will give you notes at selectable fixed intervals - these are mainly about adding harmonies and the like. Then there are also pitch-bending pedals, equipped with a treadle, that will allow you to physically bend the pitch of your note(s) up or down a set interval, like an electronic version of your guitar's vibrato bridge. DigiTech's Whammy is the 'daddy' here. Thirdly, with the popularity of drop tunings as well as capos, there's the transposition type of pedal that will kick in a selected drop or raise in pitch without the bend that you'd get with a Whammy-style pedal. One new example is DigiTech's Drop, which will lower the pitch from one semitone all the way down to a full octave.